Here you can read a little more about me as a person. My name is Rosan de Groot and I am from The Netherlands. 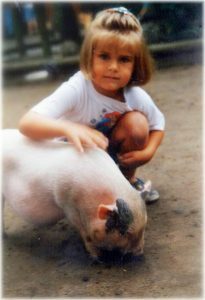 Since I was a young child I have had a strong interest in animals and their wellbeing. After high school I went to study Animal Sciences at the University of Wageningen, which I enjoyed a lot. But not everything can be learned from books. Whenever I had the opportunity to gain practical experience or travel within my studies I did. It fascinates me to see the differences and similarities in the challenges farmers face all over the world. In my opinion one of the best ways of learning things is by doing it. I worked as a dairy farm assistant in New Zealand, a cattle station hand in Australia and spent several summers in Iceland as a guide on horseback. The reason I ended up here in Sweden is my strong interest in improving farm animal welfare. Sweden seems to be always a step ahead when it comes to animal welfare regulations. I had heard several promising stories about SLU before I came here and so far I’ve never regretted my choice. No matter which programme or university, I hope that my blog will inspire you to study abroad too. Because the cliché is oh so true – travel broadens the horizon. I sincerely wish that every single person would have such an opportunity. If there’s anything you’d like to ask, you’re more than welcome to leave a reply.